As Fisher and others have noted, the Correa administration has heretofore not been exactly active in the cause of press freedom within Ecuador, and that hasn’t changed in the lead-up to the presidential election. It’s obvious that Correa is not motivated by some sudden conversion on the importance of press freedom. Correa, a Chicago-trained economist who served as finance minister before he was elected president in 2006, has governed Ecuador in a manner in no way reminiscent of Chicago economics — Correa’s been more in line with the populist chávismo left in Latin America rather than the more moderate lulismo left. In 2008, he defaulted on some $3 billion in international debt, and he’s been pointedly frosty when it comes to U.S.-Ecuadorian relations. 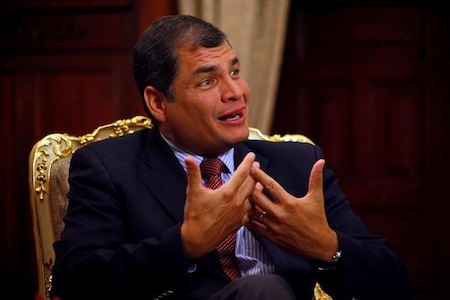 Although GDP growth has been spotty since he took office, GDP grew by nearly 5% last year, and Correa has made some progressing in reducing poverty and unemployment in the nation of 15 million, which has a GDP per capita lower than every country in South America other than Guyana, Paraguay and Bolivia. Correa’s popularity has fallen somewhat since his first election and subsequent reelection in 2009, but he still leads by a large margin against a dispersed opposition in Ecuador — a July 24 poll shows that Correa would win reelection in the first round with 50% of the vote. The nearest competitor, with 17% is Guillermo Lasso, a businessman and former president of the Banco de Guayaquil. Former president Lucio Gutiérrez, who served from 2003 to 2005 until he was removed from office after a showdown with the country’s Supreme Court, wins just 8%. So while Correa appears to have a solid lock on reelection, six months is as long a time in politics as it is anywhere else in the world, and Ecuadorians, for now, seem to approve of picking a fight over Assange. It’s a hat trick for Correa: he gets to wrap himself in the mantle of nationalism, he gets a high-profile opportunity to pick a mostly symbolic fight with a nation that’s practically the avatar of colonialism, and he also gets some nice international headlines about human rights and press freedom to help whitewash his own domestic record. Meanwhile, with the Assange story sucking up attention in Ecuador– a high-profile meeting among the UNASUR nations kicks off today, there’s even less ability for Lasso or the opposition to break through. One downside: escalating a fight with the United Kingdom could destroy what little goodwill remains in the United States for Correa — after also kicking out a U.S. ambassador and closing a U.S. military base in Ecuador in 2009, Correa could find that the United States will not renew the Andean Trade Promotion and Drug Eradication Act, a trade program from the 1990s designed to exempt products from certain tariffs in exchange for cooperation in reducing drug producing and trafficking. Since the 1990s, Colombia and Peru have negotiated their own free trade agreements with the United States, and Bolivia has been kicked out of the program, which means that the ATPDEA now affects solely Ecuador. The Assange affair may be just provocative enough to cause the U.S. Congress to allow the ATPDEA to be phased out. That, however, may not be so important to Correa, who opposed a bilateral trade agreement with the United States when he was finance minister in 2005.